Are you tired of being scared to walk your dog a night? Do you wish there was a product that could make this experience a little bit more relaxing and less anxiety filled? Well, you’re in luck because getting a LED dog collar could be the solution. But sadly, finding the best LED dog collar can be somewhat complicated. I know, that sentence sounds a little ridiculous but there are just so many options out there to choose from; it’s almost overwhelming for the consumer. Due to this, I thought a buying guide going over all the necessary information about these collars could be a useful resource; hence, the article you’re about to read. It’ll go over this product’s benefits, essential buying factors, how to clean it, etc. We’ll even provide you with 10 product reviews of the LED dog collars we consider the best on the market. So please, read on and let me help you find the perfect one for both you and your dog. Once you do find it, I promise you won’t regret it. In fact, it might even be one of the ten that I’m about to discuss in the next section! The product review section will discuss in detail the 10 LED dog collars that we consider the best on the market. In doing so, we hope to provide you with a basis of what you should expect out of a high-quality model. Our first product starts us out strong with being a high-quality, durable product, which will meet all the expectations you might have for a product such as this one. In fact, it has a lot of different features that I’m excited to discuss with you guys. For instance, I like the durable nylon material the Illumiseen LED Dog Collar is made from that’ll ensure this product stays in pristine condition for a long time. It’s construction also has a plastic quick-clasp buckle, which means this product is an adjustable collar. With being adjustable, I love that I won’t have to worry about any cutting process that you would with other collars. Instead, all I’d have to do is slide the buckle until it reached a size that was perfect for my dog. This dog collar runs on a rechargeable battery that can last up to 5 hours on a single charge, which is another aspect that I love. And the recharging process is simple as well as it can be charged with a USB cord, which speaks to this model’s convenience. I also like that this collar has three different modes, normal mode, rapid mode, and slow flash mode, that you can quickly change with one simple click. With these different modes, it gives me the feeling that I have total control over the experience, which is something I value. But unfortunately, it’s isn’t all positive with this product. Honestly, there are a few things that kind threw me off with this model. First, I heavily dislike that this model isn’t waterproof as my dog tends to run through water any chance he gets, which would be a significant problem with this collar. Second, the price is a little bit higher than I’d like. It doesn’t fall outside my budget, but it’s not a number I’d feel comfortable paying for a collar that doesn’t meet all my needs. With this in mind, this model from Illumiseen ends up being a no buy for me. But I could see how this could be an incredible option for someone given its fantastic construction and variety of modes. The Blazin’ Bison Blazin’ Safety LED Dog Collar provides you an incredible customer experience that is almost unmatched by any other collar on the market. And given this information, you shouldn’t be shocked that I find a lot of its features desirable. As an example, I love the fact that’s it's water-resistant. This capability will make my fears about this collar malfunctioning when my dog inevitable runs through some water flutter away. It’s also nice that’s been known to hold up in rainstorms as well. And if it does happen to fail, this product comes with a lifetime guarantee, which will give me some insurance. I mean, my dog tends to do things like jump in streams on a whim; therefore, you could see why I could benefit from something like an insurance policy. It also helps that this model allows you to choose between a lot of different style choices. Honestly, the number of options you have borderlines on excessive; but there’s no way I won’t find both a size and color to fit my preferences. Plus, this model’s ability to run for 8 hours off a single charge is another area where this model easily outpaces many of its competitors. As a person who intends to only use a LED collar on nighttime walks, I could get a lot of run off of one charge. However, this LED dog collar isn’t perfect as there are certain flaws that we must acknowledge. The first being its price as it's one of the more expensive products on this entire list. It’s not too extravagant, as its still dog collar after all, but it’s more than anyone would like to pay. There was also a noted concern among the customer reviews that the dog could switch off the device by scratching it. It was a relatively uncommon issue, but it still was referenced enough that I thought it was worth mentioning. Overall, an extraordinarily solid product that’s easily a must-consider; but its flaws threw for a loop, and I’d have to think about it before buying. Coming from a manufacturer that we’ll see several more times on this list, the BSEEN LED Dog Collar is a worthwhile option for any dog owner to consider. The best reason for this being a must-consider product is its low cost. As one of the less expensive products on this list, I would even call it a bargain considering all of its other notable features that I love. The first being its one size fits all collar, which actually lives up to the name. All you have to do is cut it into a length that fits your dog. And given the customer reviews, there doesn’t seem to be a dog that is too big or small for this collar. Plus, it also comes in four different colors that’ll make sure you add some style to your pup’s life. I also like the incredible brightness of this product’s LED light. It will easily be seen from long distances and will be extremely effective at alerting all those around that you and your dog are taking a nightly stroll. Given my tendency to take nighttimes walks with my dog, I’ll need a LED dog collar, which has an excessive amount of brightness. This particular model certainly fits that description. It also doesn’t hurt it has those essential three lighting modes. Its waterproof capabilities is another feature that stands out to me. This aspect immediately moves this product up my considerably as it tends to rain heavily where I live, and as previously discussed, my dog loves the water. But even with all these quality features, there’s a reason why this LED dog collar is available at bargain bin prices. In this case, it centers around the product’s longevity, which from the customer reviews seems to be around a couple of months. And once it starts getting near its end, charging the collar becomes increasingly difficult. These two flaws aren’t something you like to see in any LED dog collar. If you’re looking for a bargain that’ll provide excellent results for a few months, you can’t do much better than this particular product. But otherwise, it’s best to look somewhere else for your next LED dog collar. Our next dog collar is one of the most durable options we’ll discuss in this article. It’s made from high-quality nylon material which will make sure it’ll remain in your life for a long time. And this durable is only one of the many features that I love about this product. Aside from its incredible durability, the first thing that stands out is the LED lighting's brightness. In fact, it’s so bright that it can be quite difficult for a human to look at once their eyes are adjusted to the darkness around them. It's easy using process is another advantage that puts this particular collar ahead of its competitors. All three lighting modes are controlled by a single button, which is something I like seeing because overly complex products drive me insane. This model's rechargeable battery is also a useful feature as it has a 7-hour lifespan, which would last me well over a week with my dog walking schedule. Plus, it’s a simple recharging process thanks to the USB hookup. And it has all the other essential features we’ve discussed at length in the other reviews such as being water-resistant, a money back guarantee, coming in a variety of sizes and colors, etc. All of this put together confirms that Pet Industries did a fantastic cultivate a top-notch, user-friendly, rechargeable LED dog collar. This success doesn’t mean there aren't some flaws with this model; a common complaint among the product reviews was that dealing with the customer service was a nightmare experience. As you might expect, this aspect wasn’t something I was thrilled to see when I was doing my research. Another issue I found was this model’s design makes it bulkier than most other collars on the market; therefore, it probably isn’t an ideal fit with dogs with small or weak necks. With this set of pros and cons, it’s hard to see a reason why I wouldn’t take a chance on this product. I mean, it has everything I could ever want in a LED dog collar, and its flaws don’t affect its performance in any way. The noxgear LightHound Revolutionary Illuminated and Reflective Harness is the only harness on our list. With being a harness, there are obvious benefits this model will have over the other products mentioned in this article; some of which I like and others that I don’t. But beginning on the positive side, this model offers 360-degree illumination, which will ensure I’ll never have any issues finding my dog in the dark. It'll also make sure I’ll be able to see any potentially dangerous situations around him as well. When compared to a collar, this LED dog harness has a larger surface area, which means the LED lighting will light up a larger space. Therefore, this model tends to be a lot brighter than your typical LED collar, which is always a plus. It also offers a longer rechargeable battery life than your standard LED collar at 12 hours. In some cases, this lifespan's almost double what you’d expect from the collar-based model. As a customer who walks their dog at night frequently, this added battery life could be extremely beneficial. Other than these differences, this harness has the other essential features too such as being water-resistant and capable of adjusting to fit any dog. In more ways than one, you can tell this product was a well thought out creation. But since it's a harness, it comes with two flaws that make it a less than ideal option for some owners. For one, it’s a lot more expensive than any of the other products on our list. It easily outpaces them in price by more than double. It’s also much heavier and can be a burden to store as it takes up more room than your typical collar. This more massive design does make it less likely option for smaller dogs as well. If you’re looking for a LED dog harness, you shouldn’t hesitate to put this model into your Amazon cart immediately. It’s an incredible option for someone looking for this type of product. But for me, I’m going to stick with my collar-based models. One of the more run-of-the-mill options on our list, the Fashion & Cool LED Dog Collar provides consistent performance without causing any hassles. It doesn’t do anything too special, but it doesn’t fail to meet your expectations either. With this in mind, I’d feel very comfortable buying this product for many different reasons. The first being the fact it can be manually cut to fit any dog’s desired length. Now, I typically favor the adjustable collar over the ones that require cutting; but I can deal with it when it's as adaptable as this model. I also enjoy the color variety the customer gets to choose from with this product. There are five different color design, and all of them are capable of brightening your dog’s day. This amount of choices is more than enough to find one that fits your dog’s personality. In my case, I’d have to go with the red color choice as it seems like it’d be a good fit with my dog’s fearless temperament. But regardless of the one you choose, each one is very vibrant so you can see it from a far distance. In fact, this model features 12 LED lights around the collar itself, and together they work together to ensure you can see this collar from 1640 feet away. Its inexpensive price is another positive that we can’t overlook either. With the features above, this particular model could easily be considered a bargain. And I didn’t even get to mention it being water-resistant or having a battery with a lifespan of 3 hours. I did, however, come across one thing that was slightly concerning in my research; there seems to be a reoccurring theme of this product having longevity concerns. This development didn’t exactly shock me given its price, but it was still disappointing to see nonetheless. All in all, I’d consider buying this particular model; but with its longevity concerns, it wouldn’t be my top choice. Now, if I need something for a short period, this collar would be near the top of my list. The Great-Dealz LED Dog Collar carries the name of its manufacturer as this product is a great deal. It's actually one of the least expensive products in this article. But this inexpensive cost isn’t the only thing I like about this particular model. It has four different modes that it can provide a user with solid light, flash blink, slow blink, and off. This level of control over the experience with these type of products is always a plus for me. It gives me a feeling that things will never get out of hand because I can adjust how the device operates. Along the same lines, I also love the fact you can see LED lights from over 1,000 ft away. I think this will be more than enough distance to effectively locate my dog at any point. Honestly, I don’t there will be a time where he’s this far away from me outdoors anyway. The batteries having the capability of lasting up to 60-80 hours is another nice touch provided by this manufacturer. They even included an additional set that way you don’t have to pay for new ones right away. 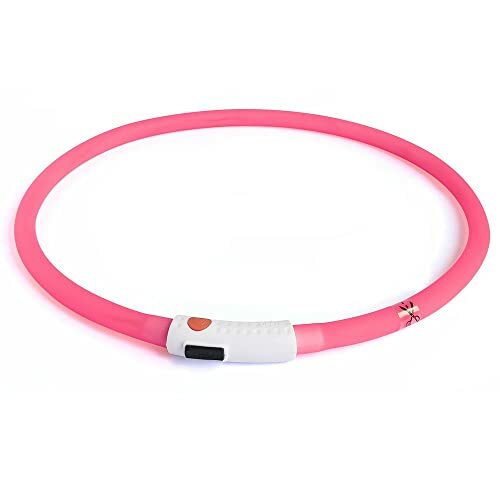 And the durable nylon material this LED collar is made from will for sure keep this fantastic product in pristine shape. It also helps that it’s weather resistant as well, which means it can handle most weather situations except the harsh ones. In all estimations, this product has minimal flaws, but there are some. For instance, this collar is too heavy to use on miniature breeds, which is a real letdown for these owners. After all, it’s such a quality product. I also don’t like that the batteries aren’t rechargeable, but that’s more of a personal issue rather than a fundamental flaw. Given these flaws aren’t too problematic for my particular case, this product could be a worthwhile option to consider. But I really don’t like the idea of having batteries that aren’t rechargeable. It just seems super inconvenient. Our second BSEEN product, the BSEEN Fashion Light Up Collar continues to showcase why this brand has such a stellar reputation. I mean, all this manufacturer does is create high-quality products that’ll meet or exceed the customer’s expectations. And this LED dog collar is no different as it features many various features that I adore. For example, its plastic tube design makes this collar incredibly easy to clean; a huge plus with me because my dog loves rolling around in the mud and dirt. It also helps that it's a one size fits all collar, which means you can cut it to its appropriate size. And according to the customer reviews, it does fit all sizes dogs. There wasn’t a single complaint about it being too small or big: a rarity with these type of products. The 360-degree visibility is another massive plus for this particular model. It also claims to do this with a LED brightness that’s superior to all the other collars on the market. I wouldn’t dispute this given the numerous customer reviews claiming its excellent performance. In other words, if it's not the brightest lighted dog collar on the market, it’s at least in the running. And like the previous BSEEN product, this model also comes in four different colors that you can match with your dog’s personality. Overall, there isn’t too much about this product that we haven’t covered in detail before, but what you do need to know is it will provide you with results. Now, there is a legitimate concern about how long a period it will give you this superior performance. From this LED dog collar’s reviews, it seems like this particular model tends to run out of juice faster than some of its competition. It’s not uncommon for people who buy this collar to need a replacement a few months later. The longevity concerns are somewhat troubling, but since it's rather inexpensive and has some fantastic features, I think I might roll the dice on this one. It has everything I want at a reasonable price, so why not? 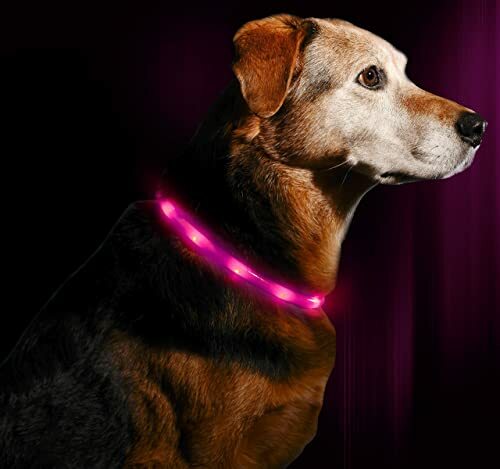 The second product on our list from Illumiseen is the Illumiseen LED Dog Necklace Collar. This particular model picks up right where the last one left off by providing customers with the same superior performance. And it offers this superior performance at an affordable price, which makes this model one of my favorites on this list. It also helps that it comes in six different colors, which will make sure I find the exact right color for my dog's style. But the part I love about this product is its lightweight design. I know, you probably think that all collars are relatively light, but this particular one is built perfectly for smaller dogs. Now, this aspect doesn’t affect my dog, but I plan on getting a smaller dog in the future, and I’m planning ahead. And I could see how this would be an ideal fit for a smaller breed. But this doesn’t mean it won’t fit bigger dogs too. In fact, this collar will fit any dog between the neck size of 11 and 27.6 inches; my dog is right in the middle at 20 inches, so it's a perfect fit. Aside from this collar’s adaptability, it also comes with a lifetime guarantee with purchase, which always a nice touch. With all these features, it’s not difficult to see why this product is in the running for being the best lighted collar on the market. But this doesn’t mean there aren’t some areas where it could improve its quality. In this LED collar’s case, the area it could improve is its durability. It seems their lightweight design has a slight proclivity for snapping or breaking to the point it's unusable. And that’d be a shame given how well this model performs. Even with the durability concerns, I could see myself trying this product out. After all, it has enough high-quality features to warrant a long consideration and comes at a responsible rate. It sounds like a good to me. 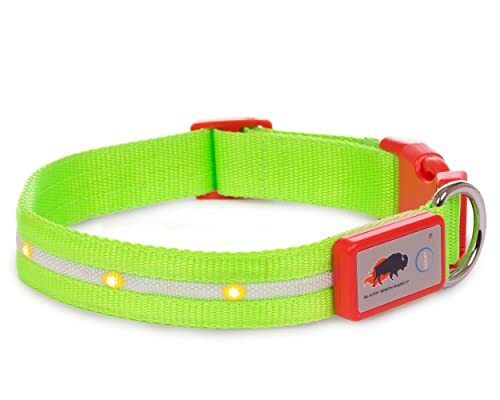 Our last product is the BSEEN Light Up Pet Safety Collar, and it certainly isn’t the least. This LED dog collar has a ton of features that put it near the top of its marketplace. And a lot of these qualities are ones that I find desirable. 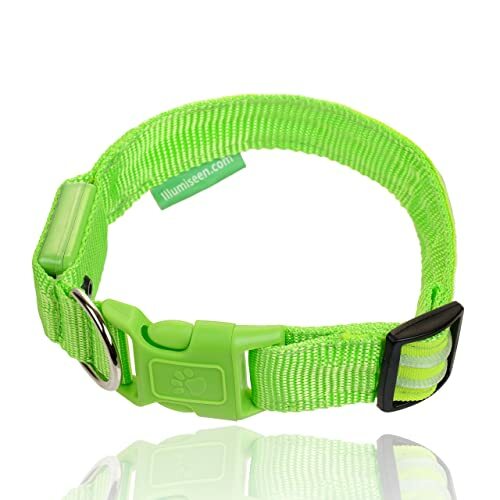 As an example, it has a more varied choice of colors with six than its fellow BSEEN LED dog collars. This feature might not be the biggest deal, but it shows that the manufacturer cares about your satisfaction; they want you to see them as a high-quality brand. Its rechargeable USB battery isn’t too shabby either with its 5 hours of usage time. And it only takes 1.5 to 2.5 hours to recharge this top-notch product fully. I also find the versatility of these model to be extremely appealing. See, this LED dog collar has the capability of fitting any dog with a neck size from 11 to 27 inches. Honestly, that’s an extensive range of dogs, and the lack of complaints in the comment section about this product not fitting their dog was refreshing. Plus, it has all the other essential features you might expect from a product among the best LED dog collars: water-resistance material, lightweight design, three lighting modes, 360-degree illumination, etc. Although there was one little thing, this particular model seems to have an issue with charging. Several customer reviews reported this model had problems staying charged after a few weeks of nighttime dog walks — something to think about before investing money into this LED dog collar. In the end, I don’t think I can get past the charging issue; therefore, this product ends being a no-buy for me. But if you think the charging problems are overblown, this collar succeeds in every other area with almost second to none performance and could represent a good bargain buy. What is a LED Dog Collar? A LED dog collar is a product that has a single goal in mind: keeping your dog safe. Its way of doing so is by providing a dog owner with a way to keep track of their favorite pet in less than ideal situations. For instance, if you’re walking your dog at night, this collar will light your dog up like a Christmas tree to make sure you know where it’s location is at all times. This illumination of your dog doesn’t just benefit you though as it’ll also make the people around you aware your dog’s there too. And this scenario is just one of many where this product could make your life as a dog owner much more relaxed. In my eyes, these LED collars are an essential tool that a dog owner must have in their arsenal. After all, it keeps your dog safe. And isn’t that what we’re looking for in any dog-related product, something that’ll help keep our favorite canine friend safe? How these devices work will depend on the one that you end getting. There are various ways these LED dog collars can use to get the job done. For instance, some will run off rechargeable batteries; others will run off coins batteries. Another point of difference is the functions of the light itself. Certain models offer you levels of light such strobe or glow, while others just stick to glowing. Honestly, each model will have subtle differences in how they work when compared to a competitor. But one thing all these illuminated dog collars have in common is the end result, which is keeping your dog safe. And they do so by following the same principle of making your dog’s presence more noticeable by illuminating them in some way. Makes Your Dog Visible to Drivers: A nighttime walk on a busy road can be quite scary and cause all sort of issues when the drivers can’t see you. But with a LED collar this problem becomes a non-issue because the collar will make your visible; therefore, preventing accidents from happening. Scooping Up Your Dog’s Nighttime Poop Becomes Easier: One of the grossest parts of being a dog owner is picking up your dog’s poop. But it can become an incredibly frustrating thing to do during those nighttime walks. However, with a LED collar, there will be enough light to make this gross experience move along much quicker. Plus, you won’t have to hold and fumbling around with your flashlight or your phone anymore. Easier to Monitor Your Dog’s Movements at Night: It’s always a comfort to know exactly where your dog is during your nighttime adventures out into the world. These collars ensure that’s easier by making your dog glow and keeping their position known to you at all times. Allows to See Where You’re Going: Nighttime walks can be quite a nuisance with the constant worry about tripping over a stick that you can’t see or underestimating a bump in the sidewalk. But these worries will go away with a high-quality LED collar. It’ll make sure you know exactly where you’re stepping. With benefits like the ones above, it’s hard to see why someone would pass up on buying these incredibly useful devices. I mean, having a safe way to walk your dog at night is such a nice luxury for a dog owner. Not to mention that if your dog runs away at night or into oncoming traffic, the LED collar will offer them some sense of safety. You’d be surprised how often a dog gets loose on a walk when their owner doesn’t pay attention for a quick second. As a result, it's always a good idea to have extra security, which this product embodies, in the event of an emergency occurs. It adds an extra layer of protection that will help keep your dog safe and a part of your life for years to come. There are certain factors in play that’ll help you determine whether or not the product you're considering is the best one for you. And that’s what we’ll discuss in this section to help you start circling what you want from one of these models. 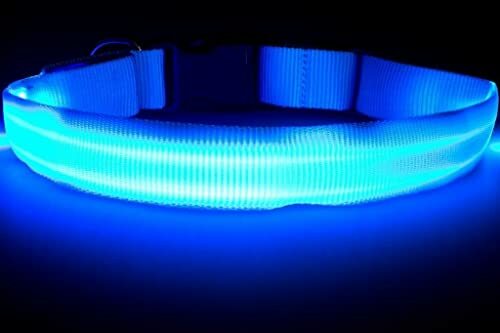 The first thing you should be looking for in a LED dog collar is durability. After all, you’re going to want a product that lasts more than a few walks, which is why you need a model made from high-quality materials. In other words, you’ll need a LED dog collar that’s built to last. It’s also essential you remember that these devices come with electrical components; cheap electrical parts are prone to failures, which could cause all sort of issues. With this in mind, it’s best to spend a little extra money on a collar with higher grade electrical components than buying a cheaper model. You can also examine the product’s quality/durability by looking at those all too important customer reviews. LED dog collars come in all different styles with their own set of specific features and accessories. For instance, some models come with LED strips that go around the entire collar and others have sections where the LED lights reside. As a result, you might find it essential that your LED collar has a design with 360-degree lighting rather than only having certain sections. In my particular case, I’d opt for the 360-degree lightning to ensure I have a full view of my dog’s location and what’s around them. Other style decisions you might have to make are things like color, additional features, materials, etc. 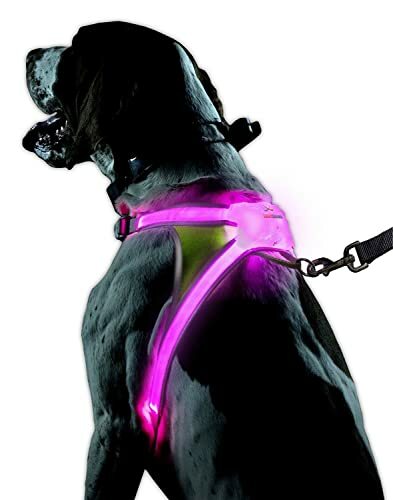 You might even opt for getting a LED harness over a collar for the more secure feel. In the end, it’s making decisions about these little style details like these that’ll decide whether or not you’re satisfied with your purchase. The sad truth is no LED dog collar will be completely waterproof due to their use of electrical components. But some models offer resistant against water and could withstand being in a downpour. With this in mind, I recommended making sure the one that you end up buying has at least some water-resistant capabilities. After all, you never know when a rainstorm is going to come out of nowhere and get you soaking wet. In these circumstances, a non-waterproof or water-resistant model will cease to work and might cause some other issues as well. And you’ll be back on Amazon looking for a new model to spend your money on so you can feel safe walking your dog at night. Given this information, doesn’t it seem like getting a waterproof or water-resistant model is the right move? Honestly, all the top LED collars have this capability, and it does come in handy since dogs love running through water. 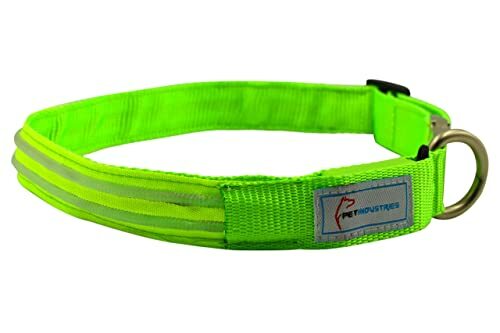 As you start searching for the perfect LED dog collar, you’ll come across a couple of different adjusting methods. Some of these models will have a resizing buckle that you can slide until you find the right size. Other collars will require you to cut the LED cord to the desired size. Given this predicament, you’ll need to decide which method fits your preferences the best. I will always recommend going with the collars that have the adjustable buckles. These models offer you more convenience and the capabilities of using the collar on multiple dogs. But it’s essential we note that these collars tend to cost a little bit more than the others. With this in mind, you’ll have to weigh whether or not its adjustable capabilities are worth the extra amount of money. 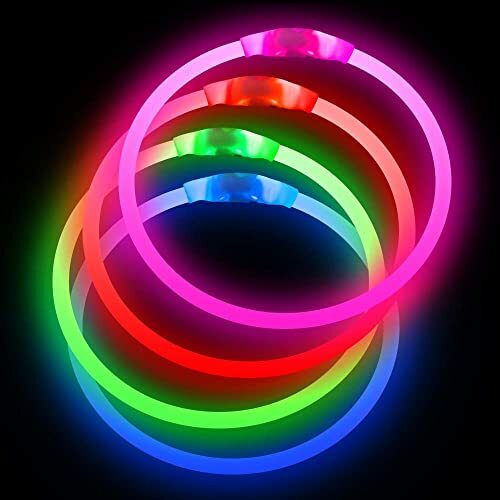 If your LED dog collar doesn’t provide a bright light, all the features in the world won’t matter; it’ll be rendered useless and a waste of money. But thankfully, all the models we’ve mentioned in this article are considered well lit. However, if you decide on buying a LED dog collar that isn’t in this article, you should test out the product’s brightness before purchase. It’ll give you an idea of whether or not the intensity is up to snuff. Of course, this solution isn’t possible for online shoppers. You’ll have to rely on the accounts of your fellow consumers through all those customer reviews. If there’s a brightness issue, these reviews will for sure let you know about it. With most LED dog collars, its battery will be of the rechargeable variety. These batteries are incredibly convenient as all you have to do is let it charge through its USB cord. But if you get a model with a rechargeable battery, make sure it has a long battery life. There’s nothing worse than a rechargeable product that can’t keep its charge. I mean, if it can only function for 20 minutes off charge, is there even a point of it being rechargeable? The answer is no. Aside from the rechargeable battery models, you’ll also find some LED dog collars that are run by coin batteries. These batteries tend to hold a charge longer than your typical rechargeable variety, but they're less environmentally friendly and convenient. Therefore, you’ll have to decide which works better for you just like with these rest of these factors. In my opinion, I tend to value convenience over everything else so I opt for the rechargeable battery products whenever I can get them. In this section, we’ll try to answer any remaining questions you have about LED dog collars. We hope that these answers will help you determine whether or not these products are the right fit for your favorite pooch. What are good led dog collar brands? As with all products, certain LED dog collar manufacturers stand out from their competitors. In my personal opinion, these companies are the ones we mentioned in our product review section: Illumiseen, BSEEN, Pet Industries, Great Dealz, noxgear, Blazin Bison, and Fashion & Cool. But the two that separate themselves from even this stellar competition are BSEEN and Illumiseen. And I thought that providing you with a little background information about these two companies could help you identify why they're above the rest. With a mindset like this one, it’s no wonder why Illumiseen has become such a sought after company in the dog collar industry. Put all these qualities together, and you have an industry leader that’ll regularly provide top-notch products, which will ensure your nighttime walks are entirely safe. Why LED dog collars rock? These collars might seem like a luxury item to some of you. But as previously explored above, these products can make your life a whole lot easier. It can provide you with a useful accessory that ensures nighttime walks aren’t the stress-inducing experience you know them to be currently. I mean, think about all the wonders this could do for both you and your dog. For instance, your nighttime walks won’t have to be rushed. You could instead take your time and make sure your dog has a good time rather than them feeling anxious because you are. In fact, these collars are a lifesaver for anybody that has the 9 to 5 lifestyle. There will be no rush to take the dogs out before the night hits or taking short walks because it’s starting to get dark. Just flip the collar’s switch, and it’s almost like you’re walking during daylight. All in all, these LEDs collars provide way too many benefits not to be seriously considered by every dog owner. And think you’ll never have to balance a phone or flashlight in one while picking up poop with other ever again! Are LED dog collars safe? In most cases, these LED dog collars will be entirely safe. These products typically use such low voltage that using them would be the same as any other regular collar. But you should always ensure the collar is high-quality by reading the customer reviews. If there were a malfunction or safety issue, it'd most likely be talked about in these reviews. Trust me; if there’s something fishy going on with a product you’re considering, a previous buyer will let you know about it. You should also be aware that LED dog collars created outside the United States could be more prone to having specific issues. These products don’t have to pass the rigorous tests and regulations that a US-based one would. As a result, it’s probably a good idea to stick with considering only US-made LED dog collars. But even if you do consider non-US made products, reading the customer reviews should still be a good way of separating the high-quality from low-quality models. How to cut a LED dog collar? There are no real special instructions to cut an LED dog collar. In fact, most of them are adjustable, which can save you the hassle of dealing with the cutting process. These adjustable collars can be a real godsend and are adaptable to any situation. But regardless of whether you cut a collar or get an adjustable model, you should be able to put two fingers between your dog’s neck and their collar. This guideline will ensure the product is a comfortable fit, but snug enough that it doesn’t come loose. If you want a more precise guideline, you could always measure your dog’s neck yourself. The process for doing so is wonderfully outlined here in this Youtube video. Obtaining these measures will make the entire searching process much easier. After all, you would now have parameters that you could use to limit your search toward collars with these dimensions. Can dogs swim (bath) while wearing the collar? Is it waterproof? 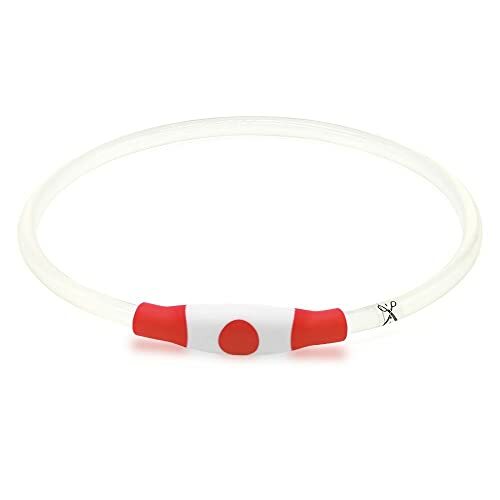 Even the LED collars that are waterproof or water-resistant can’t handle being worn during water activities such as swimming or taking a bath. And the others that aren’t waterproof at all will not be able to handle any water interaction. With this in mind, I’d recommend only considering the models that are waterproof or water-resistant. After all, you don’t want to get caught in a nighttime downpour, and all of a sudden have a serious safety issue on your hands. And even if you go with a waterproof LED dog collar, it’s essential you ensure that the product has this capability. Some manufacturers will lie about this feature to make their item seem more desirable. Due to this, you must read the customer reviews. The previous customer experiences that lie within these resources will dictate whether or not you can trust the manufacturer of the product. How to clean a LED dog collar? Cleaning a LED dog collar can be quite problematic because they use electric components. But some manufacturers, as you well know by now, have figured out a way around this issue and made their collars waterproof. But even with waterproof lighted dog collars, you’ll need to make sure these electric components don’t get completely wet. Therefore, the cleaning process of these products will be a little more complicated than your standard collar. This process will start with you taking out two teaspoons of apple cider vinegar and mix it with a teaspoon of baking soda along with one cup of hot water. Once you combined all these ingredients, grab a cloth towel and dip into the mixture. You then use the towel to clean off any debris or dirt from the collar. After removing the dirt and debris, use a new cloth towel and warm water to clean the mixture off the collar. All you need to do from there is place the collar somewhere in the sun, on a flat surface or your laundry line, so that it can dry. 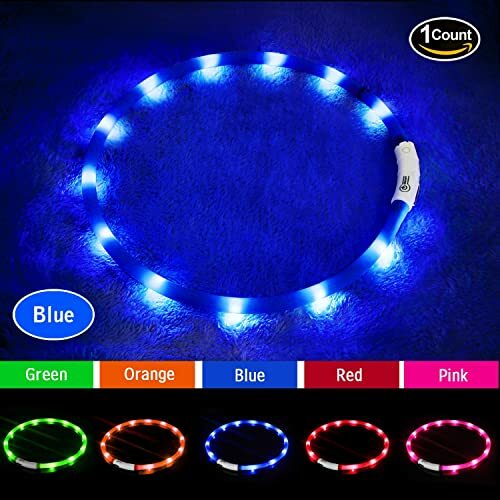 The number of LED collar choices available to you is quite overwhelming. Which is why understanding all the ins and outs of these products is such an essential step in finding the perfect one for you. Since you now have all this information at your disposal, finding the best LED dog collar shouldn’t be the stressful experience you might’ve envisioned. It’ll instead be a painless process that should end up with you feeling satisfied with your purchase. You might even find out that the collar you’re looking for is one from our product review section. After all, these are the best on the market, and I’m reasonably confident that any one of them will get the job done. And once you find a high-quality option that meets all your needs, don’t overthink it. You should put that collar into your Amazon cart and get back to more important things like taking your dog on walks!